With millennial preferences in mind, Care Net has developed an educational “app” for your client room toolbox. 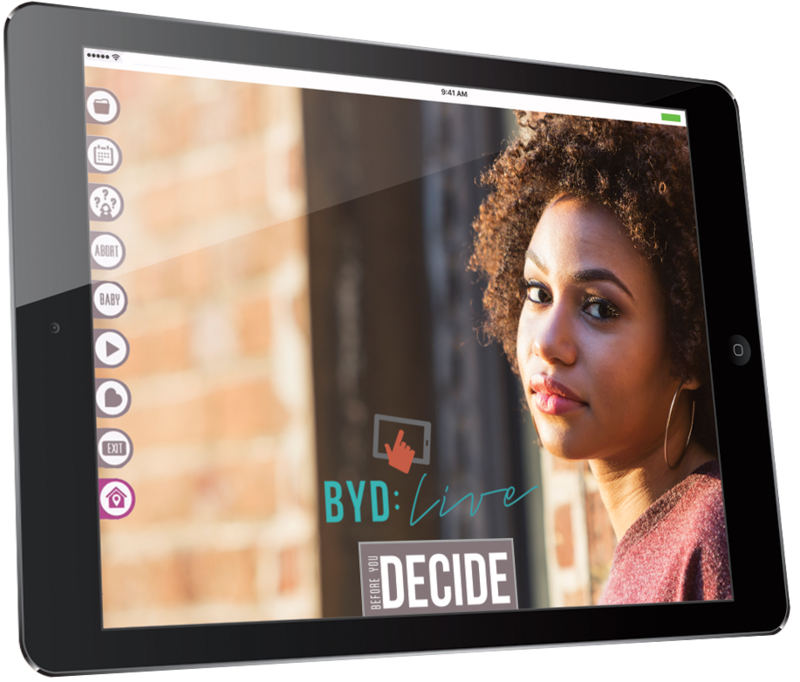 A perfect complement to the conversation and relationship building that is the signature of your client care, the BYD: Live app creates an interactive, visual experience for the client to learn about pregnancy options, including abortion, adoption, parenting, and marriage. It is the perfect companion to Before You Decide (BYD), our popular magazine-style resource, which expands on the information in the app. BYD: Live is not a digital version of the Before You Decide magazine. It is a completely original, interactive experience for your clients, inspired by the content of the magazine. $19.99 annual automatically renewing subscription. When the app is opened, you must be connected to wifi in order for your tablet to verify your subscription. You can then disconnect from wifi and still run the app, as long as you leave the app running (do not close it). In line with Care Net’s standards of excellence, the app has been approved by Care Net’s Medical Advisory Board. Would you like to know which tablet devices* BYD: Live is approved for? Here's a list of which tablets to use. Do you have additional questions? Check out our FAQs! Questions? Email us at appsupport@care-net.org. *Please note that BYD: Live is specifically a tablet app and can be used with certain devices. It is not formatted for use on either a laptop or desktop computer.